Yes and No, and by that I mean yes. I mean that in the least confusing way possible. It’s so easy to question your teacher – especially with SO many different styles of yoga, SO many different teachers, and SO many different perspectives. Not to mention all of the ego’s floating around out there! This doesn’t have to be confusing. People love to make things more complicated than they are, and it’s actually really simple. The practice of Ashtanga Vinyasa Yoga is a deep and internal spiritual study, so your ashtanga teacher is so much more than just a teacher of postures (but that’s a whole other post!). I’ve gone back and forth with studying with one teacher, then studying with many as I was searching. I even questioned if I really needed a teacher at all. What I’ve found is the more I move away from my teacher, the more I crave tradition and consistency. Here’s what I mean by yes and no. Yes, you always need a teacher. 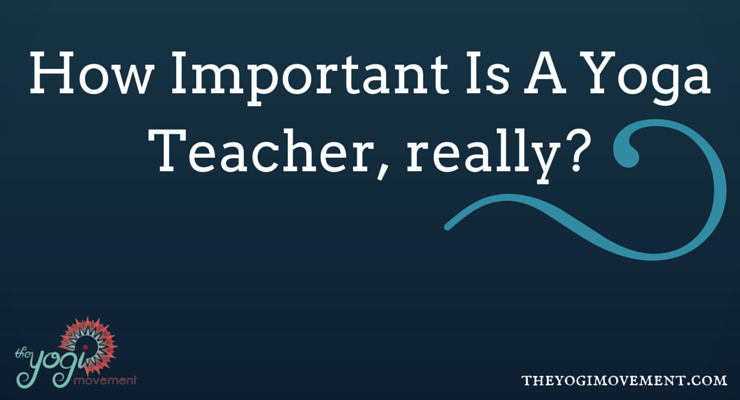 The student-teacher relationship is extremely important, and I learned this from personal experience. A teacher is able to see things in you that you may not see in yourself. A teacher can guide you in and out of postures and help deepen your practice. A teacher will notice your strengths and weaknesses and help you to create balance. Surrendering to a teacher will help you grow because you’ll work with non attachment, letting go of ego, humility, and acceptance. You’ll learn the most about your mind and your body by listening to what’s going on in your practice. A teacher helps to guide you, but your real teacher IS your practice. Practicing on your own, outside of a studio with others, helps you to hold yourself accountable. When you don’t have someone telling you what to do, or the energy and competition of people around you, you will have to make yourself get to the mat and challenge yourself on your own. Exploring other teachers is helpful. You might learn something new that changes aspects of how you practice. It’s also interesting to learn the history by working with senior teachers who were taught at different times. However, your teacher is your teacher. This doesn’t change your teacher or your practice. I needed to accept my teacher. I had some trouble letting go of my ego, and I was having too many conversations with others about it rather than just listening to my own guide within. Once I was able to tune in, the practice started to flow into my heart, and everything became lighter. I don’t always see my teacher, but I check in when I can. Trusting in the student-teacher relationship has helped me grow. The more I learn and grow, the more sacred I hold this relationship. Are there times when you should change teachers, or qualities to look for in a bad or good teacher? Of course. But that’s for another time. Choose one teacher – and let go. Learn more about Ashtanga Yoga and the Parampara tradition by watching Ashtanga Yoga New York. It’s a really moving Documentary where Pattabhi Jois visits New York to do a workshop, and the September 11th terrorist attacks happen while this was all going on. Gweneth Paltrow and Willem Dafoe discuss their experience with Ashtanga, which is really interesting! Click Here to learn more! Tell me if you’ve ever struggled with having a yoga teacher. Have you found your teacher? Have you had a bad teacher? What’s your experience? « Are your apologies genuine?